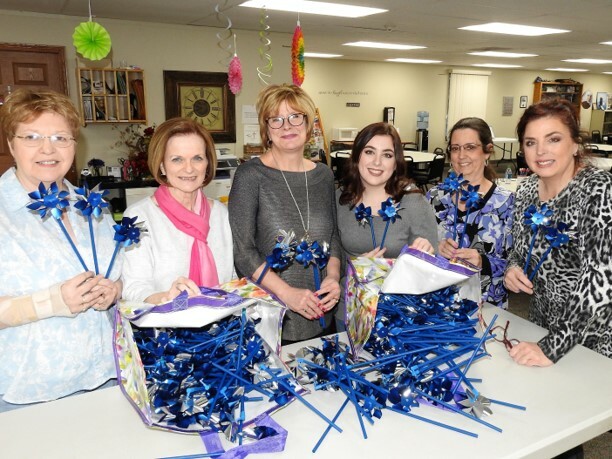 Members of the GFWC Austintown Junior Women’s League assembled pinwheels during a recent meeting that were placed at Austintown Township Park in observance of April being National Child Abuse Prevention Month. Also at the meeting, members collected nonperishable goods to donate to Second Harvest Food Bank. There was a presentation by Younstown State University honors students Ryanne Lambert, Hannah Crites and Jillian Penman about the Pen Pal Program in which YSU students join with students from elementary schools in Mahoning and Trumbull counties. Above, from left are AJWL members Janice Simmerman, Lynn Larson, Marie Dockry, Ryanne Lambert, Mary Herschel and Jennifer Bodnar. March 30, 2017 6:34 p.m.